I love ribs. In my opinion appreciating ribs is a prerequisite to humanity, I mean even vegans love ribs right? Right?? But I run into too many people that think great BBQ ribs are only made by some inscrutable, arcane process that’s understood by an elite few from the hills of the Carolinas or the burning coastal plains of Texas– grey beards dripping with special sauces and beer bellies bursting with BBQ lore! In reality ribs are simple (just a little time consuming). Let me show you how. 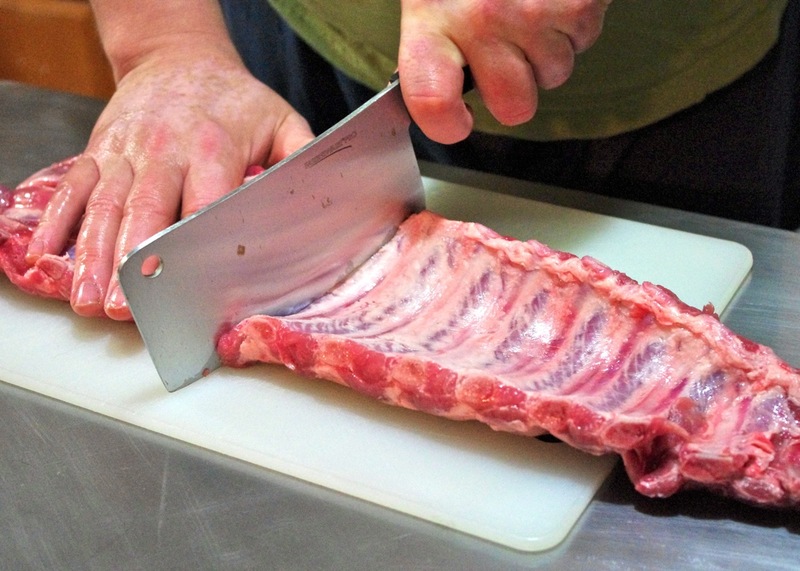 Baby-backs are the first small rib joints that connect to the back of the pig. I personally prefer spareribs because they’re huge and I’m greedy. Baby-backs are very popular now and because they cook quickly they’re a good choice for the beginner. 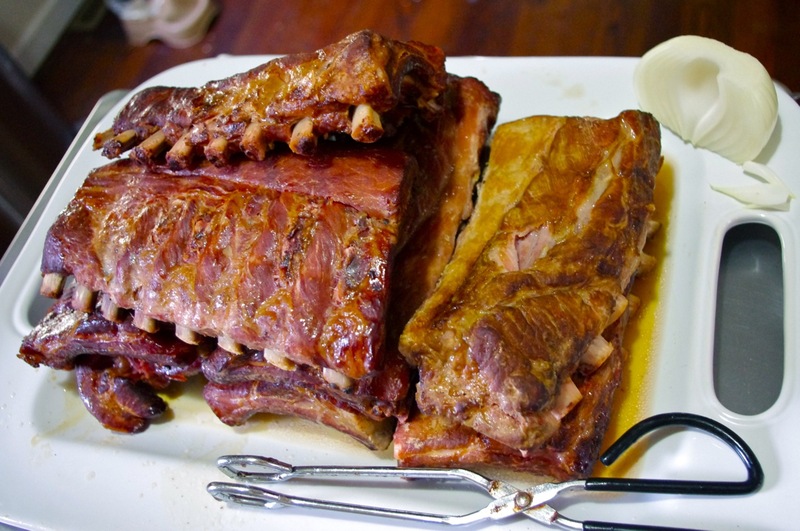 St. Louis ribs cook the same as spareribs but they look prettier– if you’ve got a good cleaver and like pretty ribs try your hand at them (you just need to cut through the last joint at the tips of the ribs to make them square). 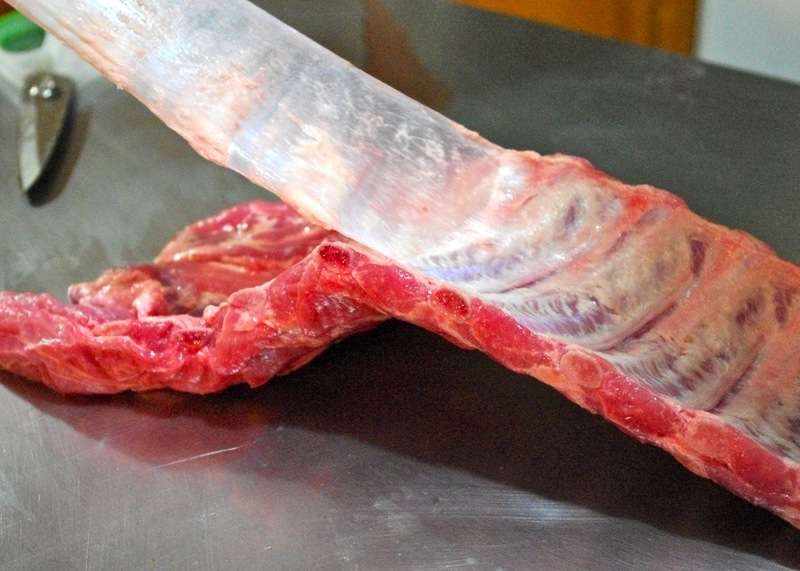 ALL cuts of pork ribs have an inedible membrane over the less-meaty, bone side that MUST BE REMOVED. If you don’t you’ll end up with a burnt, tough, parchment-like gristle on your ribs that make them hard to separate, and hard to eat. Not good. Luckily, it’s not very difficult to trim. 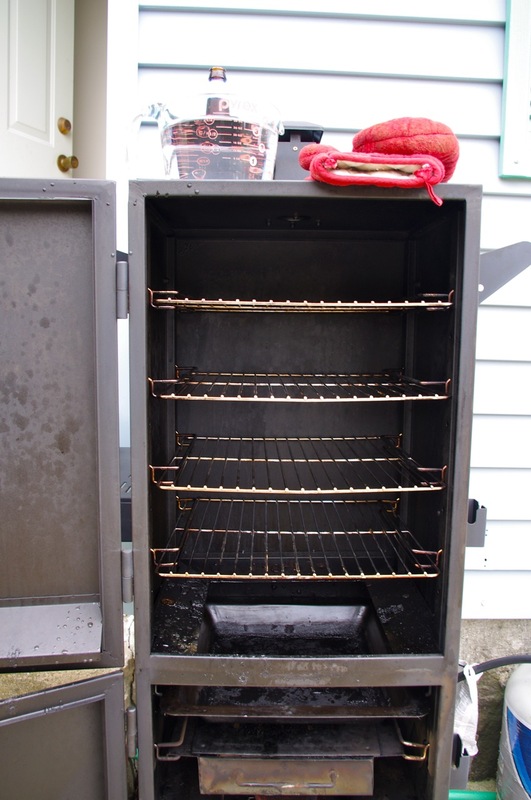 Start with a rack that’s been rinsed and patted dry. With the meat side down use your finger to separate the membrane from the bone. The easiest method in my experience is to work your finger between the last two ribs on either side and slowly push it in between the bone and membrane until you’ve loosened a large enough space to grip it. 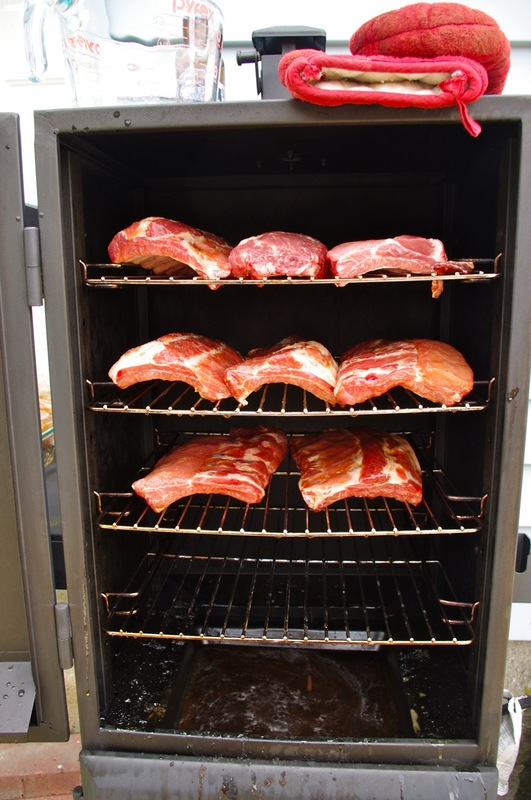 I’m using a rack of baby-backs for my demonstration below. Once you’ve separated enough of the membrane to get a grip it’s helpful to use a butter-knife to loosen it from the bone as you gently tug the membrane free. 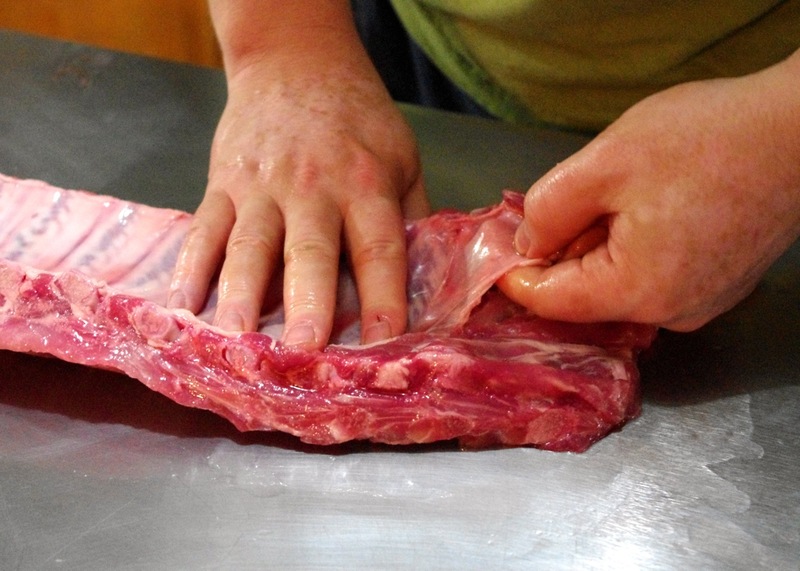 Simply run your knife back and forth along where membrane connects to the ribs as you gently tug up as pictured below. 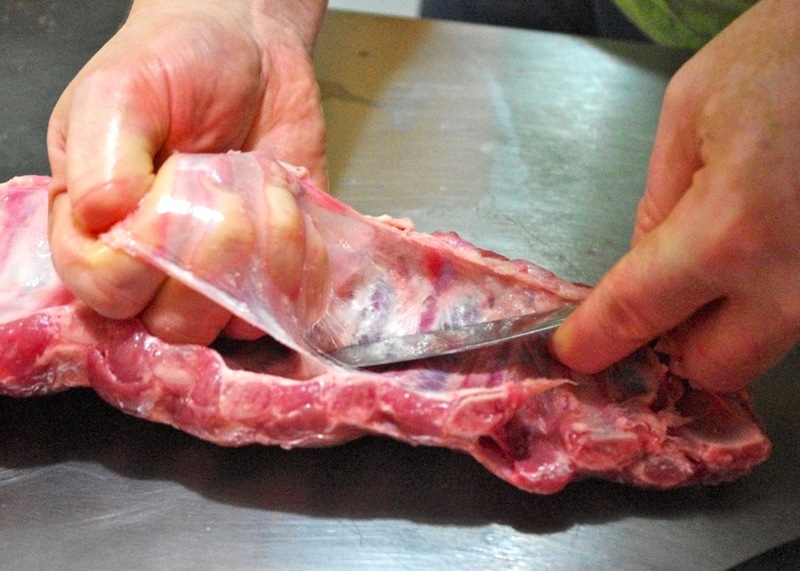 Once you’ve loosened a few inches of membrane from the entire width of the ribs you should be able to carefully peel the rest of it free. If it breaks just repeat the first steps again and it’s okay if a few small pieces adhere but try your to get it all off if you can. That’s it! 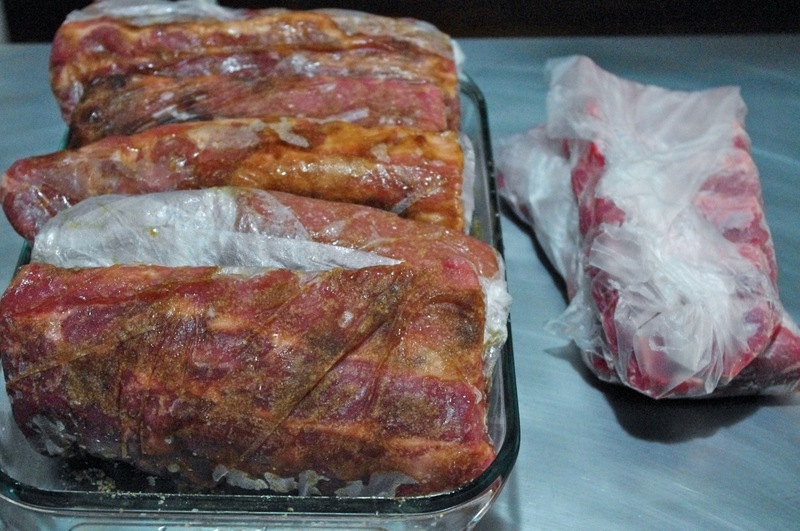 At its simplest that’s all the prep you need to begin cooking pork ribs. Of course, there are all sorts of optional trimming and prepping you can do. For example, spareribs have a flap of loose meat that some people like to cut off and cook separately – it cooks quickly by itself and makes a nice snack while you’re waiting for the rest of the ribs to finish! All I’m going to do is split the racks in half so they fit in my smoker (cooking ribs is the best excuse get a quality cleaver). Even though your ribs are ready to cook if you want to do them Memphis or Kansas City style you’ll put a dry rub on them. I’m not going to cover rubs because there are thousands of them from sweet to spicy for you to try but here’s a good place to start looking for inspiration. 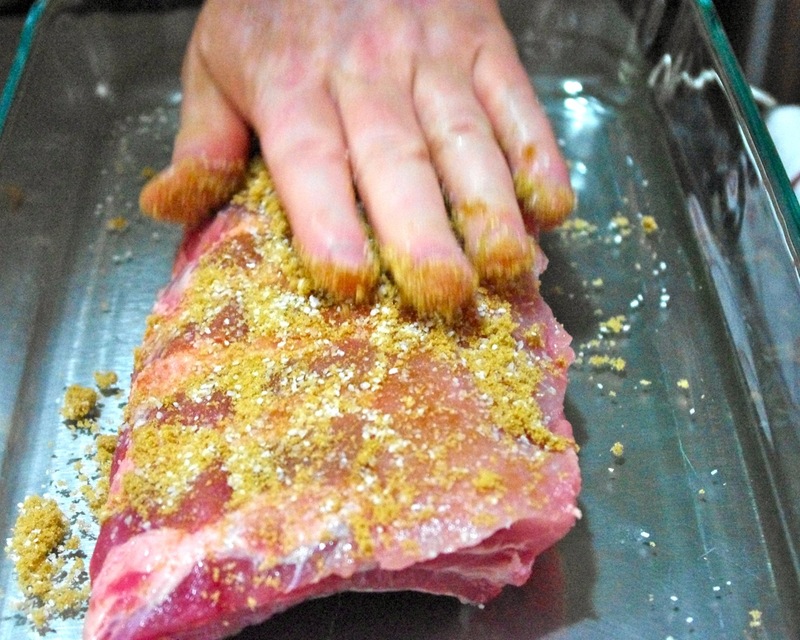 If you DO use a rub you’ll want to apply it to your ribs, then cover with plastic wrap and refrigerate overnight to give the spices time to work their magic on the meat. 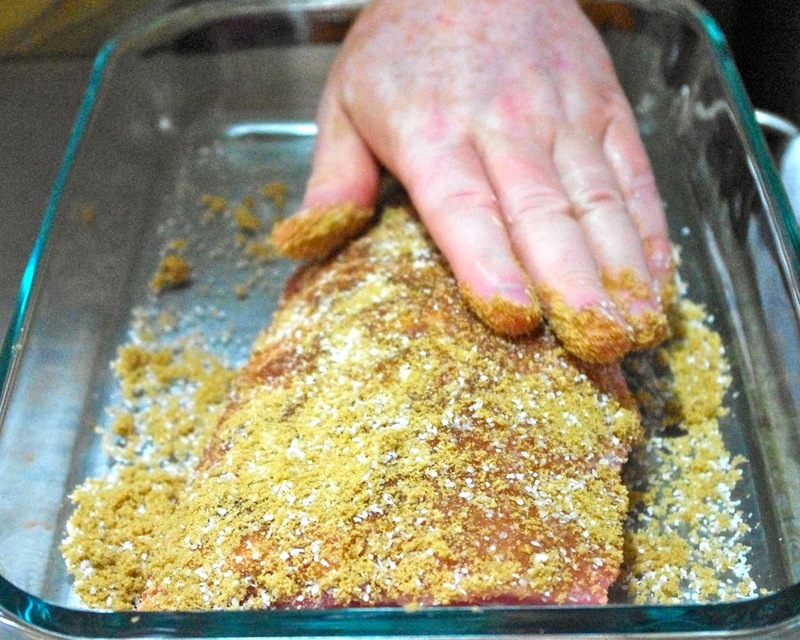 One of my guests is very sensitive to spices so I’m going to use a simple curing rub; sugar and salt, like you would use on bacon, ham or cured fish. I use 8 parts dark-brown sugar to 3 parts kosher salt and I’ll rub this on the meat side of the ribs and let them sit overnight. This will make the ribs slightly sweet and salty. Now that’s done I really AM ready to cook. 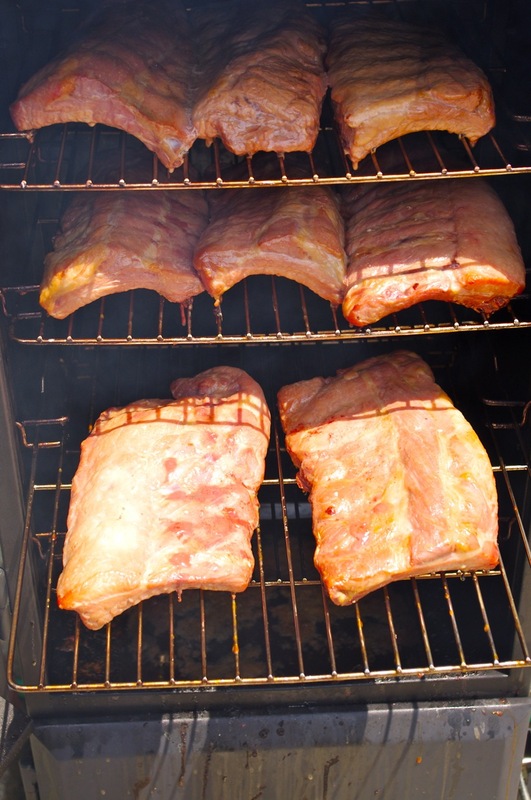 Smoking ribs adds a wonderful smoke flavor to the meat but it’s not necessary to enjoy them. What IS necessary is that you cook them low, slow and moist so that the fat and connective tissues have plenty of time to render and break down gently. This means you want to cook ribs between 220F and 240F (225F is the sweet spot) using indirect heat in a smoker, oven or grill with a pan of water to keep the cooking chamber humid. If you use a grill you’ll want the coals (or gas flame) on one side and the meat on the other side over a water pan. If you use an oven, fill a 9×13 pan with water and place it under your ribs. However you get heat to your ribs remember this formula: 3-2-1 for spareribs (or St. Louis cut) and 2-2-1 for baby-backs. That’s 3 hours uncovered, then 2 hours covered in foil for spareribs, or 2 hours uncovered, 2 hours covered for baby-backs with the last hour uncovered with sauce , optionally, if you want to serve your ribs with sauce on them; I always serve my ribs with sauce on the side so I skip this step (your ribs will be fully cooked without it). 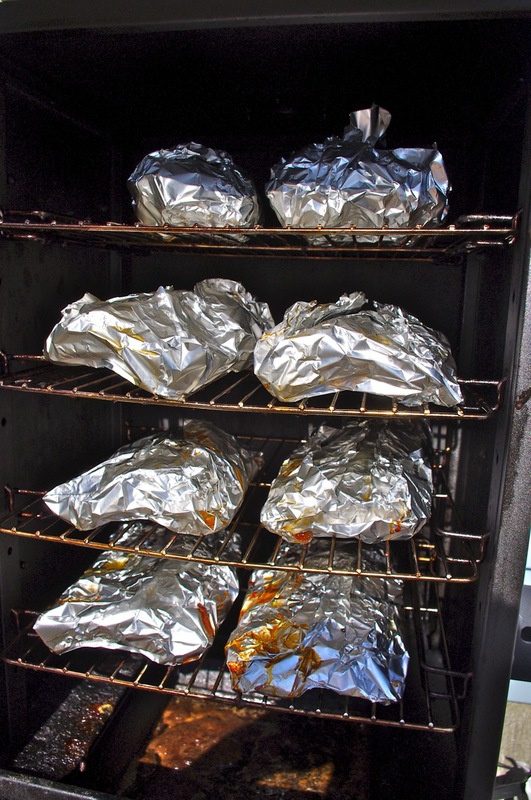 I have applewood in my smoker and a pan full of water; my ribs are ready to go! Remember these are baby-backs so I’ll smoke them at 225F for 2 hours uncovered. I want to keep my ribs moist so I’ll baste them twice, in this case every 40 minutes (or every hour for spareribs). Just as with rubs, everyone has their favorite baste– beer, apple cider, and cider vinegar are popular choices; but chicken broth, brine, or even simple sugar water is fine. Whatever floats your boat and suits your taste. The point is keep the ribs moist! These are the baby-backs after the first 2 hours of cooking and basting. I’ve kept my ribs cooking slowly for 2 hours over applewood smoke and a pan of water, basting every 40 minutes. Now it’s time to cover them in foil adding about a tablespoon of whatever you’re basting with (I’m using apple-cider vinegar and water). This allows the ribs to steam in their own juices for the last couple hours. When you’re done this step the meat will fall off the bone every time, I promise! At this point you can finish them another hour, uncovered with sauce applied or take them straight to the table like I do and use a dipping sauce it’s all up to you, but as you can see even though it’s time consuming, it’s very, very easy! Something just wrong about rubbing kosher salt on pork – like bourbon and holy water or something ; ). That said, this sounds absurdly delicious. How soon can you ship me a rack?? LOL it IS ironic isn’t it? Kosher salt is a curing staple because it’s coarse and dissolves slowly, to be honest if I were REALLY curing I’d use an even coarser sea salt to dry the meat’s surface even more without making it too salty, but that wasn’t my goal today.